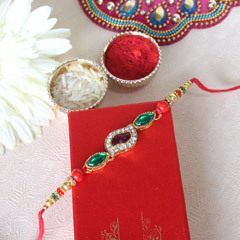 Willing to dazzle up your brother’s wrist with a sparkling Rakhi? Well then here is the range meant for you to explore. This range is inclusive of most impressive varieties for Diamond Rakhi that are designed and crafted in intricate and beautiful designs. No wonder, the sparkling diamond like stones will bring a sparkling smile on your dearest one’s face. 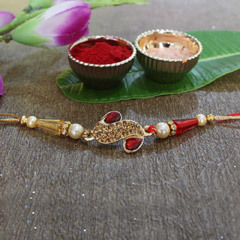 Scroll the page below to find the best Rakhi for brother. 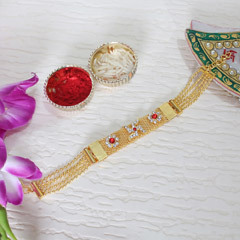 Make the occasion of Rakhi special by gifting your brother a diamond rakhi this season. 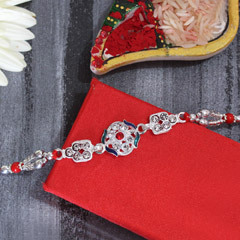 We have skilled artisans who exhibit commendable workmanship in crafting eye-catching rakhis. Celebrate the brother-sister bonding with pomp and glory on Raksha Bandhan. Do not worry if your brother is in Singapore and you cannot visit him during the rakhi festival. Select an enticing rakhi embellished with diamond stones from Sendrakhi.com along with dry fruits, motichoor ladoo, kaju katli and various other Indian sweets, flowers or chocolates. 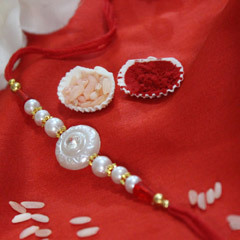 It is an easy procedure for selecting and buying rakhis from our gift portal, Sendrakhi.com. 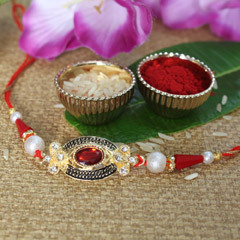 We have a humongous collection of rakhis that includes Zardosi, silver, Rudraksha, fancy, designer, diamond, mauli, kids, Lumba, bracelet, handcrafted etc. Select your rakhi after creating an account and proceed to the payment portal. We accept an array of payment options. Choose your mode of delivery from our options that include standard, midnight and fixed time delivery. 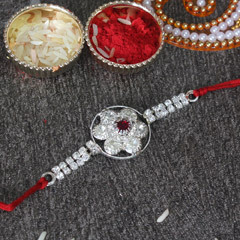 Over the years there have been many changes in the rakhi festival. There has been amplification in the scale of celebration. Apart from handcrafted stylish rakhis, gifts and food play a major role in the festival. Choose from our assorted gift hampers. You can even customize your own hamper to send it to your brother in Singapore. Make use of our intricately designed diamond rakhi and alluring gift hampers to make your brother happy during this rakhi festival.